Hawaii's Raeceen Woolford dove to come up with a dig on a kill attempt by San Jose State during the second game. SAN JOSE, Calif. » The day had been long enough without adding a long volleyball match to it. When faced with putting San Jose State away in three games or going to a fourth last night, No. 15 Hawaii opted for short and sweet. Led by Jamie Houston's 20 kills and 16 from Sarah Mason, the Rainbow Wahine swept the Spartans 30-20, 30-25, 31-29 in 95 minutes. A pro-UH crowd of 1,081 saw the Wahine (9-4, 3-0) extend their Western Athletic Conference winning streak to a national-best 110, defeating the Spartans for a 28th straight time. Hawaii moved into a share of the conference lead with Nevada (9-6, 3-0), which upset No. 22 New Mexico State last night in Reno, 30-28, 30-28, 19-30, 28-30, 15-12. Teal Ericson had 15 kills and Karly Sipherd 14 for Nevada, which travels to Hawaii for a match next Sunday. Alice Borden led the Aggies (17-1, 3-1) with 19 kills. "I'm not surprised that Nevada won," Hawaii coach Dave Shoji said. "Nevada's always tough at home. I thought New Mexico might go in there with a little more attitude. "It just shows that winning on the road is not easy." Hawaii handled San Jose State fairly easily in the opening 25 minutes at Spartan Gym, leading by as much as 27-15. Two aces by the Spartans helped them pull to within 28-20 before a kill by Houston and another by Juliana Sanders ended it. San Jose State stayed close in Game 2 until a 4-0 service run by UH setter Kanoe Kamana'o -- which included two of her three aces -- gave the Wahine breathing room at 20-13. The Spartans hung tough, holding off three game points to pull to 29-25, before Houston finished it off with her 15th kill. 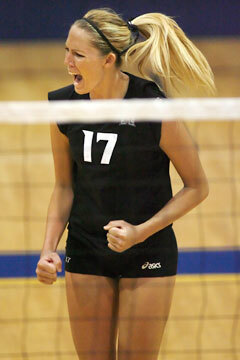 Hawaii's Sarah Mason celebrated after the Rainbow Wahine closed out their 3-0 victory at San Jose State last night. The seesaw Game 3 saw the Spartans use an 8-1 run to take an early 11-7 lead. The Wahine rallied to go ahead 14-13 only to see SJSU go back on top at 17-14. Hawaii seemingly had the sweep in hand when gaining match point at 29-27. Houston was blocked and Jessie Shull's fourth ace of the match tied it at 29-all. Mason ended it with two consecutive kills, to hit .484 with just one error in 31 attempts. The senior hitter also had 11 digs for her second straight double-double. Jennifer Senftleben led the Spartans (9-7, 0-3) with 15 kills. SJSU had 10 aces but were outblocked by Hawaii 12-5. "Mason got us a couple of key points at the end," Shoji said. "She had a really good night. Juli (Sanders) also had a good match (10 kills, .600, 5 blocks). "We made the plays when we had to. We had problems passing in all three games, were very inconsistent, and it almost cost us at the end. But overall, we hit very well (.393) and Kanoe was one of the reasons we did." "My MVP would be Sarah," Houston said. "She pulled it out for us at the end. "It was good to get a win, great after we had such a long morning." Hawaii had to get up early yesterday morning to catch a 7:50 a.m. flight to San Francisco from Fresno. The Wahine were going to have another short night as they were scheduled to leave for Honolulu on a 9 a.m. flight out of San Francisco. This schedule is nothing compared to the hectic one over the next two weeks. Starting with Friday's match against Utah State at the Stan Sheriff Center, Hawaii will play seven matches in 11 days, two homestands that bookend a trip to Louisiana Tech and New Mexico State. Aces --Hawaii (7): Kamana'o 3, Lee 2, Gregory, Houston. San Jose State (10): Shull 4, Collet 3, Tsukano, Conrad, Senftleben. Assists -- Hawaii (52): Kamana'o 51, Lee. San Jose State (37): Conrad 18, Collet 15, Shull 3, Tsukano. T -- 1:35. Officials -- Jesse Martinez, Ray Mink. A -- 1,081.